Mapping rabbit activity including warrens, dung piles, scratching and damage caused by rabbits. Recording control works such as baiting, warren ripping and harbour removal in your local area. On this page, you can get information on what to do if you have a rabbit problem in your area. 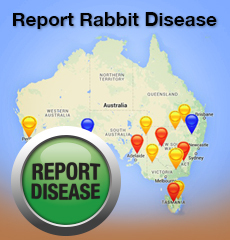 It will be regularly updated with current information regarding rabbits on Phillip Island. Rabbits are identified as a key threatening process to biodiversity in Australia. They not only damage native vegetation, spread weeds and cause erosion. High rabbit numbers allow other feral animals such as feral cats and foxes to proliferate and can also undermine buildings and damage crops and pasture. It is a legal responsibility (as part of the Catchment and Land Protection Act, 1994) of each landowner/ manager to control rabbits on their property. Rabbits don’t recognise property boundaries, which makes them a community problem that we must all tackle together. The most effective way to control rabbits is to use a range of integrated control techniques. The most efficient and long lasting strategy is to stop them from breeding by destroying warren systems, removing harbour and blocking them off from getting under your house or wood pile. These breeding areas need to be mapped so that they can be revisited later to check for reinvasion. Successful rabbit control is a long term commitment, there is no quick fix and it requires a sustained effort. Start recording rabbit activity now! Click here to start mapping. We will produce a regular newsletter that will be accessible from here. Please check back soon to read the latest Newsletter. How to use RabbitScan - Download the information pack.